Reasonably Well: We Found "Where the Lilacs Still Bloom"
We Found "Where the Lilacs Still Bloom"
Yesterday, the sun was shining, the skies clear and a brilliant blue, and Terese and I were barreling north on I-5 in Goldie. What perfect weather for a mission. Each year, thousands of visitors step back in time to discover the 1880's Victorian Farmhouse and country gardens that comprise the Hulda Klager Lilac Gardens. The national historic site is located 30 minutes north of Portland, Oregon and 2-1/2 hours south of Seattle, Washington at 115 South Pekin Road, Woodland, Washington 98674 (mailing address: PO Box 828, Woodland, WA 98674). To showcase the site, the Gardens and historic buildings have been lovingly maintained by the Hulda Klager Lilac Society, a nonprofit volunteer organization. The Society fully funds the care and upkeep of the historical site from the proceeds of Lilac Days, dues and donations. With the help of our volunteers and members, the Society continues to carry on the work of growing and showing the beautiful lilacs including those hybridized by Hulda Klager many decades ago. Continue reading here. We couldn't have timed our visit better. The gardens were fragrant and absolutely beautiful. I found the history of the gardens fascinating. In 1905 she began hybridizing lilacs and by 1910 she had created 14 new varieties. By 1920 she had developed so many new varieties that she decided to hold an open house each spring when the lilacs were in full bloom to share her efforts with other lilac enthusiasts. 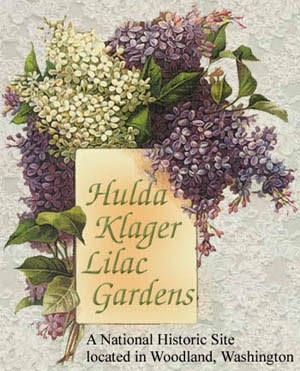 This practice caused her to become known as “The Lilac Lady.”.......Through the years, Mrs. Klager was been honored by many organizations for her work as a leading hybridizer of lilacs including the State of Washington, the Arnold Arboretum at Harvard University, the Federation of Garden Clubs in Washington and Oregon and the City of Portland, Oregon. Wouldn't it be great to have one of Hulda's lilacs growing in MY garden? I thought. I asked a garden volunteer if they had any of Hulda's hybrids for sale, thinking that my chances were slim to none, but to my delight there was one variety left. I snagged a Pink Elizabeth as quickly as I could. Please, please God. Don't let me kill my Pink Elizabeth. Terese was interested in different varieties, understanding that these were not developed by Hulda. Man. It took every ounce of self-control I could muster to avoid bringing home more than one plant. And who could blame me when choosing between all of these beauties? We both chose our plants and stuffed them into Goldie. They fit perfectly. Terese's plant had one very sweet smelling bloom which made Goldie smell absolutely delightful. As we finished tucking our treasures into Goldie, we headed down the road in search of more flowers, this time tulips as we saw signs for a tulip nursery close by. We were told by the staff that the peak of the blooms had been a few weeks earlier. How fabulous that must have looked. I thought the fields that we did see were beautiful. So, I don't know why I repeatedly ask Terese to pose for pictures. I simply asked her to poke her head through the yellow tulip. But no. Being Terese, she would only consent to having her hands and ONE FOOT photographed. I thought it was impressive that she could maneuver her leg up there for the shot. I tried but couldn't hike my foot up high enough. After our tulip adventure, we hopped into the car while smiling smugly. Our mission was proceeding even better than planned. What we thought would be the easiest part of the trip - to find a little restaurant for lunch that wasn't a fast food place or a chain - proved to be the hardest challenge of all. I won't go into the sordid details except to say that our smugness evaporated quickly. We waved at Hulda's lilacs as we passed them at least three times meandering through town trying to find the place the Google Maps insisted was RIGHT THERE. We settled for a sandwich at a bar and grill decorated profusely with moose. Not as quaint as we had hoped after sniffing heirloom lilacs, but it was a satisfying lunch. And I told Terese had we not stopped, I would have eaten my shoe. The BLT on sourdough was considerably tastier, I think. Our grins returned as we zoomed south. Ahhh. What a day. If you're in the Woodland area, and are lucky enough to visit during the three weeks (yes, they are open just three weeks of the year while the blossoms are best) think about stopping by. 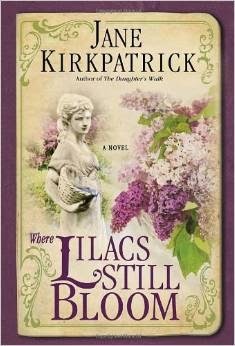 You can read more about the amazing Hulda Klager in the novel Where Lilacs Still Bloom by Jane Kirkpatrick. Hi Julia. Those are some really lovely photos. I love lilacs. When I was a kid in Quebec, we had some very old lilacs growing along the side of our century farmhouse. When my husband and I bought our house the first thing I planted was a lilac bush. I have a few of them and my neighbour has one as well. They are just starting to wake up here south western Ontario. Can't wait to be able to wake up to that lovely smell in the morning.